Did you know that in 1964 our unofficial muse and the man behind the famous Band on the Wall logo, jazz legend Dizzy Gillespie, ran for President and promised to make Miles Davis Head of the CIA? This t-shirt is inspired by that presidential campaign. 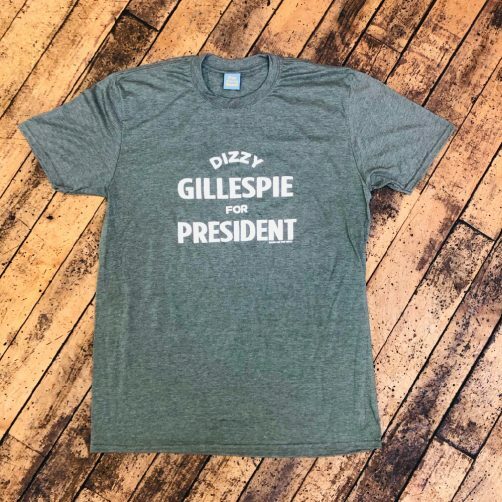 The perfect gift for the jazz lover in your life – let’s Make Jazz Great Again. Hand screenprinted in the Northern Quarter, printed on Gildan Softstyle 100% ringspun cotton fabric. Each shirt is finished with a custom embroidered Band on the Wall tag.